If you want to learn how to develop in Alpha Anywhere, you'll find there are plenty of books, guides, videos, tutorials and other resources to get you started and to answer your questions. To help you get your bearings—and to show you what's available—we have created this guide page. Note: In some of our documentation, we refer to Alpha Anywhere by its former name, Alpha Five. If you are new to Alpha Anywhere, the best place to get started is with our getting started videos. The series starts with a high level overview, continues with a tour of the development environment, and ends with instructions on installing the software. We suggest you watch them in the order we have listed. It takes 25 minutes to watch all four videos, and they will give you a great foundation for building your first application. 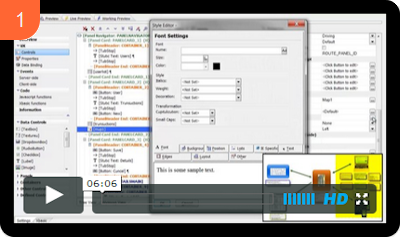 Free quick start tutorial for building web and mobile business applications with Alpha Anywhere. Through five chapters of step-by-step instruction and screenshots, you'll learn how Alpha Anywhere works and how you can quickly access the large store of builders, documentation, and videos that will expand your knowledge and give you help when you need it. Once have installed Alpha Anywhere, a great way to learn is by doing. 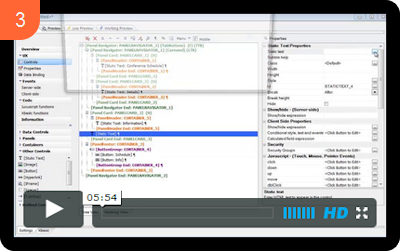 This 90-minute video takes you through the steps of building your first application. 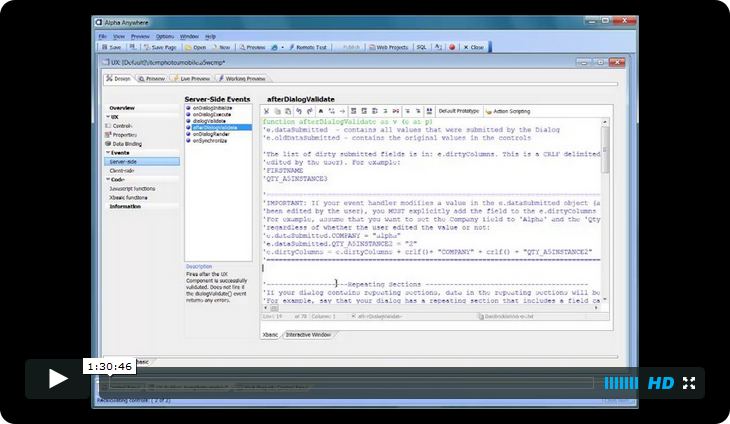 You begin the course by setting up a SQL table, which you then use to build a browser application. The application is then further built to work on a mobile device, and to access a phone camera. The pace is slow enough so that you can build the application along with the video, without needing to stop and rewind. If you have a second monitor, or a tablet, we suggest that you view the video on that while following along in Alpha Anywhere to build the application. If you prefer written instruction instead of a video, a complete transcript with step-by-step instructions is available for download. After you have completed the tutorial above, there is another tutorial that goes further in depth into building mobile applications, and shows you how the sample mobile application that ships with Alpha Anywhere was built. The tutorial is still in development, but is useful as is. You can find it here: Tutorial: Building the Sample Mobile Application. When it's time to build your own application, there are three primary Alpha Anywhere reference material resources: the Alpha Anywhere Video Finder the Alpha Anywhere Help System, and the Alpha Anywhere Wiki. Generally speaking, if you are looking for how to do something, the Alpha Anywhere Video Finder is a good place to start. You can access the Video Finder from within the software by choosing Video Finder from the Help menu. While the Alpha Anywhere video finder is a great resource for when you're at your development machine or PC, if you'd prefer to watch tutorial videos on the go, check out the beta of our responsive video app at videos.alphasoftware.com. This responsive HTML5 app, built in Alpha Anywhere, brings our video library to every device. The Alpha Anywhere Help System is your primary guide to the Xbasic programming language, containing both reference and tutorial material. 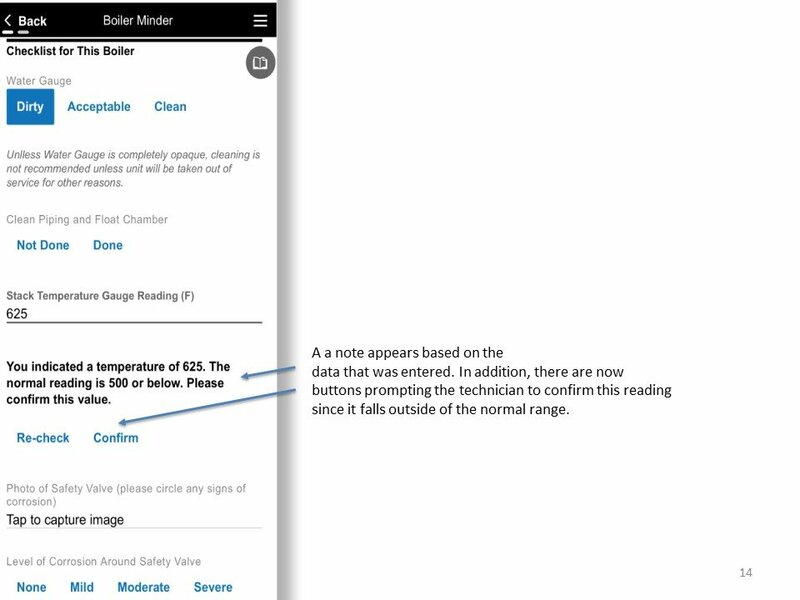 To get to the help system from within the software, choose Open Documentation from the Help menu. To get help on a particular topic, click the Topic List tab and type a keyword to filter the list of topics below. The Alpha Anywhere Help System. In this example, we searched for functions, and selected a directory of encryption functions. 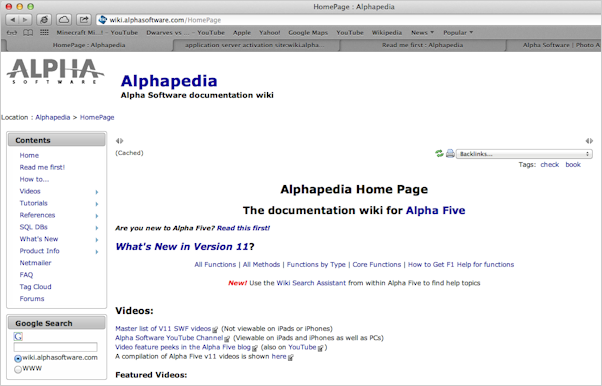 The Alpha Anywhere Wiki can be found at wiki.alphasoftware.com. The wiki contains virtually everything that can be found in the help system, plus it contains how-to articles not found in the help system. There are several ways to search the site, including a full-text search, however we have found that Google has done an excellent job in indexing the wiki, so we suggest you use the Google Search widget on the wiki homepage. Given that the wiki contains virtually all of the information contained in the help system, you might be wondering why you should bother using the help system. The answer is that it's faster to search for Xbasic functions and methods using the help system—and the help system is available to you even when you are not connected to the Internet. 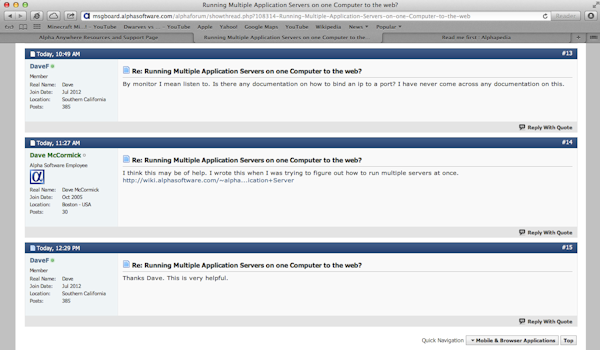 The Alpha Software Message Board is an active community of Alpha Anywhere developers. It is a wonderful resource to both learn and share with other developers. The message board is maintained and monitored by Alpha Software—and registration is required to search or post messages or questions. You can register for an account here. To keep our message board spam free, we will require your first post to be approved by a moderator. If you encounter any difficulties registering, please use this contact form to reach us and we will gladly help. If you are new Alpha Anywhere and would like support to help you evaluate it, please fill out the form on the new user support page or call us at +1 781.229.4500 M-F, 9am-6PM EDT. Should you encounter issues during installation or startup, please send an email to custserv@alphasoftware.com or call us at +1 781.229.4500 M-F, 9am-6PM EDT. Advanced support options are also available. These include technical support incidents, where we work with you to solve a problem, and mentoring, where we match you with a qualified Alpha Anywhere expert that you can turn to for advice. See our Services page for information on these options. Need help building your application? 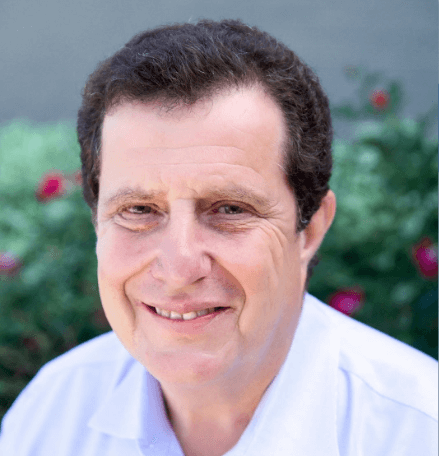 Our professional servies division—Alpha Consulting Services—provides you with everything you need to get your custom business applications off the ground. Our certified Alpha Anywhere development team can develop, deploy and maintain sophisticated, mission-critical HTMl5 business apps for you in the fastest, most cost-effective manner possible. To submit a project request, simply fill out this form. In addition to resources available from Alpha Software, we also work with partners, who offer books, training courses, and application hosting services. Liberty Manuals specializes in printed (and electronic) documentation for Alpha Anywhere. There includes tutorials, reference guides, how to manuals and more. There website iswww.libertymanuals.com. ZebraHost is our trusted hosting partner, with a lot of experience in hosting applications of all sizes. They help with cloud hosting, load balancing, scaling, security and more. Their website is www.zebrahost.net.